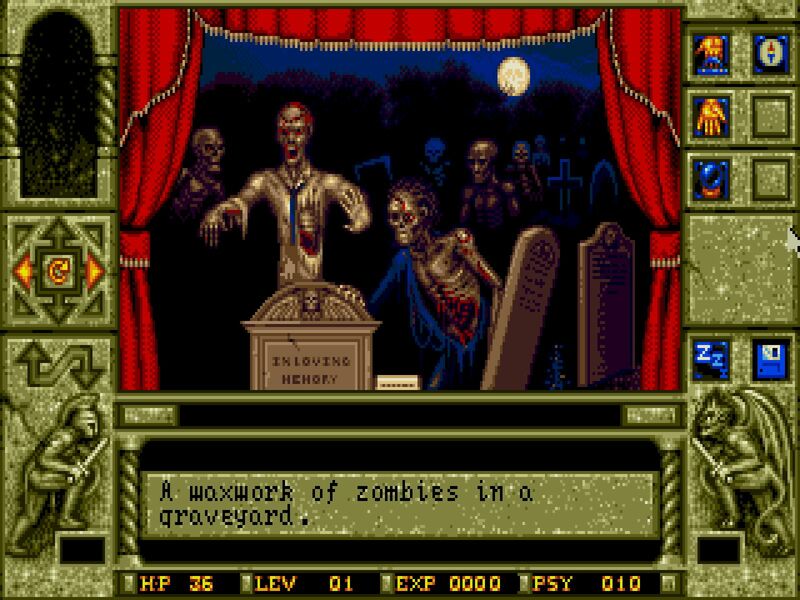 As I said, Waxworks is the last game created by Horror Soft using a modified version of the Abermud engine. 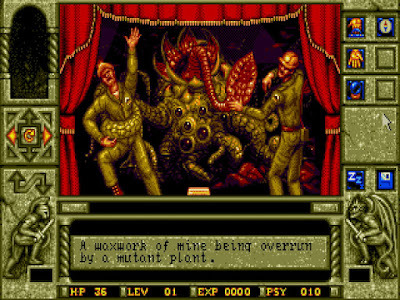 Abermud was the first popular open source MUD and the people from Horror Soft took it and used it for their games, starting with Personal Nightmare, the two Elvira’ and finally Waxworks. 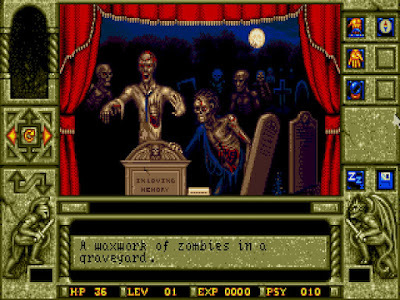 Both Elvira 2 and Waxworks use the latest version of the engine, AberMUD V, that the company later gave back to the open source community. So don’t expect too many differences between Elvira 2 and this game. In fact, we get the very same leading trio of Mike and Simon Woodroffe, don’t miss the interview Joe did with Mike, and Alan Bridgman. Apart from that, we also get most of the other people back from the Elviras, the music of Jezz Woodroffe and the graphics of Paul Drummond. All of them usual suspects in Horror Soft’s games. The only thing is that they went and hired a writer called Richard Moran instead of them taking charge as usual. Let’s see if that paid off. The story so far is one of curses through history. We play the role of “unnamed player character”, a tormented soul since the day his twin brother, Alex, got lost in the tunnels under Vista Forge, our hometown and an old mining village. The remaining family of three left shortly after the incident, to try and avoid the constant remainder of Alex’s demise. However, our eccentric uncle Boris remained there in his stone mansion, more a gallery than a home. A gallery to the macabre, to the horrors of history preserved in wax. The waxworks. From the strange rituals of ancient Egypt to the murderers of Jack the Ripper, mostly chosen, because I think Horror Soft didn’t trust its audience recognizing any more historical events than that. Today, after so many years, we come back to our hometown to pay respect to our uncle. The return brings back so many memories. For example, like that one time our uncle came visiting to our new home and told the family about the curse pending over them, like the sword of Damocles. In the middle ages, one of our ancestors caught a witch stealing a chicken. The farmer cut the witch’s hand as a punishment, and was about to finish the deal when his wife intervened and stopped it. That gave the witch time to cast a curse on the family. It seems like in the ancient Egypt, their ancestors gave birth to twins, one good and one cursed by an evil pharaoh. And so, the witch decided that every generation bearing twins in the family from that day on would have one twin being good and the other being at the service of Beelzebub. The curse of Ixona. So, usual stuff with twins as the Simpsons have already stated. The farmer’s wife gave birth to twins, with the evil one having deformed hoofed feet and becoming Vlad the Impaler. The guy got hold of the witch and tried to lift the curse, not so bad so far, but when he couldn’t make her do it, he decided to impale her. And more than half of the population of Romania and Turkey with her. For good measure. But that gave the opportunity to uncle Boris for finding her remains, whose location was revealed to him in a dream. 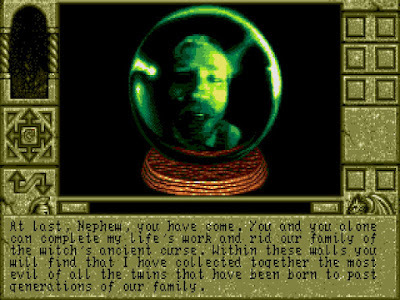 Those included a crystal ball that might give the family the key to fight the curse. However, with Boris now lying at the bottom of the earth, that seems lost forever. That is, until he conveniently wrote a letter to us before dying, telling us that Alex is alive and well, is the evil twin in this generation and has the power to create an army of zombies from the horrors of the past. And once again, we must try and avoid the end of the world due to supernatural threats. Our only help? The waxworks that Boris gathered in his mansion are doors into the distant past of our family’s twins, which we can influence and make the good triumph over evil. Or something like that, because the manual says we have to stop Alex but the intro says we can save him by defeating the waxworks. Anyway, we have the help of our uncle Boris, whom we can contact through the crystal ball for help and… that’s about it. So get into a waxwork, defeat the evil twin and get back. Got it? Good, because although the history so far is quite well detailed, I recommend reading the manual (the version sold in GOG doesn’t contain this), that’s everything we are going to get. 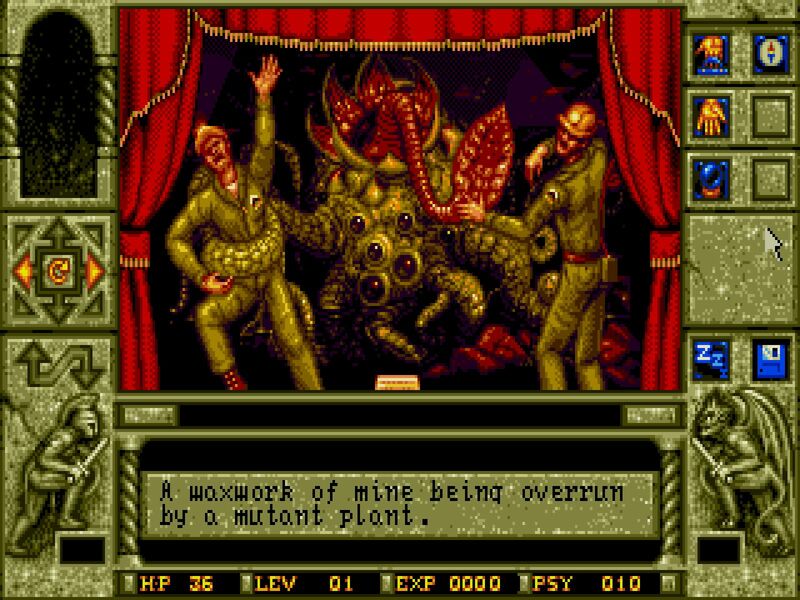 The game contains four waxworks that we must defeat. There is no order to them and items do not carry over. Basically, the idea of the three sets from Elvira 2, only even more independent. Let’s see what they are all about. The ancient Egypt shows the original twins. One being the ranking member of the local sect of Anubis with the habit of sacrificing virgins to the god of death. The other being a prince whose fiancee has been kidnapped by his evil twin and had decided to go rescue her from the sect’s pyramid by himself. Instead of sending his army. Because reasons. The mine is home to an abomination. The seventh pair of twins gave birth to the dark priest of a chaotic cult that practiced satanism and black magic. He was given a formula to make better humans. Extreme vegans if you like. So extreme they started to become plants. The evil twin in fact became so deformed he could no longer move and was placed deep inside a mine with his worshippers feeding him human flesh. He was defeated by a safety inspector that went to the mine to file a report. He turned out to be the good twin. 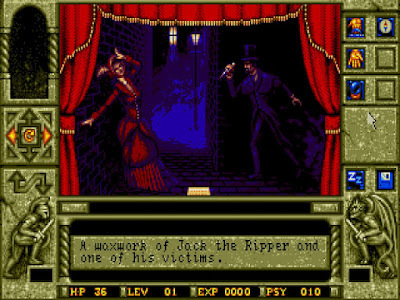 Jack the Ripper. Do I need to say anything else? He kills women of the night in Victorian London and we decide to stop him because… erm… we were there? Dreamt of it while smoking opium? The graveyard is home to the fifth pair of twins. The evil one turned to be a natural necromancer that set shop in a graveyard while dedicating himself to make acquaintance with his ancestors. The good ones were now turned into zombies. The evil twin was defeated by a gravedigger that went to the graveyard to search for his lost shovel. And those are the scenarios I will be spending my next thirty/forty something hours for your pleasure. Since we can tackle the game anyway we want, let’s start a vote that will decide in which order I will play it. There are scenarios that are a bit more dungeon crawly than others. 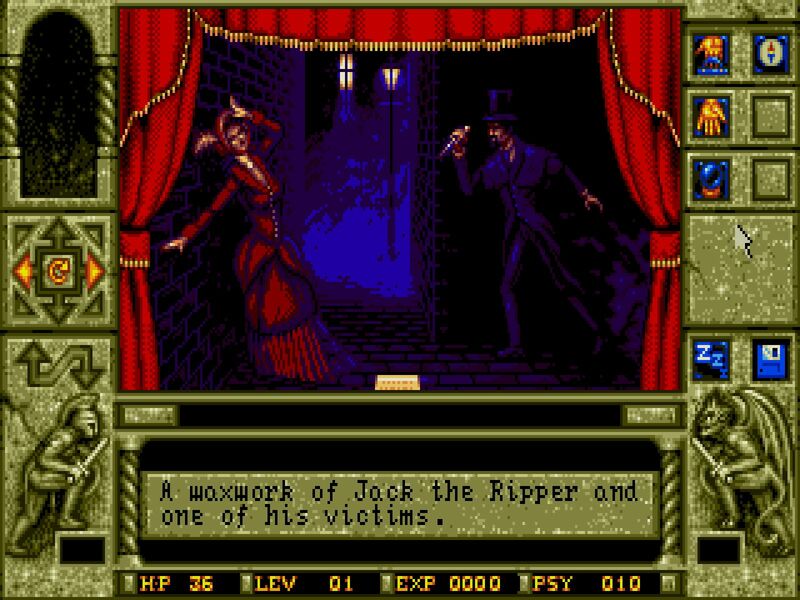 For example, from what I have read, Jack the Ripper is the most puzzle filled waxwork, while the pyramid is perhaps the most RPG-like. Everyone seems to agree that the easiest one is the graveyard. We will close the poll by Friday, ninth of November. Also, don’t forget to bet both on the score of the game and the number of unique death gifs. After all, this is a Horror Soft game, and the most gruesome to date. By the way, I am having some problems recording the game using Dosbox internal record mechanism, colors go haywire. I have managed to make a clean recording with Open Broadcasting Software (OBS) but the images get scaled up and I would prefer to keep the original 320x200 resolution. Any help in this regard is welcomed. 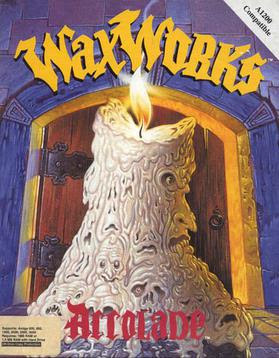 See you at the waxworks!! I finished the game doing the scenarios in which I thought would be the historical order (1. Egypt, 2. Graveyard, 3. London, 4. Mine) and it worked pretty well. I found Egypt easier than the Graveyard, and both easier than London and the Mine, so the historical order also worked as an easier-to-harder order. I'm going to guess 47 with a death count of 13. And I'm going to attempt to play along seeing as I bought the game at some point. As for which order, Agrivar's reasoning seems sensible to me so I'm considering suggesting you do the opposite just to be mean! Mwuhahahah. Am I understanding the backstory correctly? In the MIDDLE AGES one of our ancestors got cursed by a witch to bear cursed twins... one of which was born in ANCIENT EGYPT? That's a powerful retroactive curse. Oh I see. Thank you for the clarification. Let's do this mathematically. First Elvira (from 1990) got 53 and second (from 1991) got 45, which means that Horrorsoft games followed the formula P = 15 973 - 8y, where y is the publication year and P the PISSED score of the game. With the publication year of this game (1992) we get the result 37 for the PISSED score. Seems believable. A decent writer might perk the thing up a bit, if they found a decent writer that is, so I'm going for 52, with 26 death scenes (for the simple reason that it is half my guessed score). Agrivar's sequence makes most sense to me as well so it gets my vote, unlike TBD who has decided to act the evil twin. Well, doing my suggested sequence in reverse (which it is was TBD said) can still be considered doing the sequences in historical order, just from the more recent to more distant in the past. And although I think that option means starting with the hardest scenarios, I think that the harder scenarios were also the shorter (I remember the pyramid map being much bigger than the mine map), so you lose and gain something with each approach. Based in the rating of 53 for the first Elvira, I'm going to be very generous and suggest a 56 for Waxwors, and a death scene count of 28 (using the ShaddamIVth method of using half the guessed score). Speaking of decent writers, is anyone familiar with the works of Richard Moran? I wasn't able to find him for sure with an Amazon search but I didn't look too hard. I'll guess a score of 44 and a death count of 22. This is with no interest in playing the game whatsoever, but of course I'm here for the lively conversation and the tasty treats being served in the side room. If you hadn't guessed, we have had to say farewell to the poll widget, which Blogger though to be useless. We now tried to use Surveymonkey, instead, mainly because it was the quickest solution we could find. Any comments on the choice and suggestions for other polling options are quite welcome. 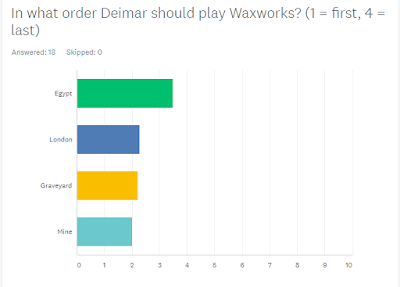 As for results, there's still some time to vote, but at the moment we have fifteen answers, clear majority of them wants Egypt done first, most want Mine to become last and with London and Graveyard we might have to toss a coin. Couple of hours still, but now, with 16 votes in, the order appears to be: Egypt, London, Graveyard, Mine. I'll guess 51 for the score and 13 for the number of unique deaths! As for recording on Dosbox, if you're using Windows 10, you can use hhe built in game recorder. You just Windows Key + Alt + R to start and stop recording and it saves them to your Videos/captures folder. 48 for the score and 24 for the number of deaths, I remember this one being very graphic. I'm going to go with 44 and 25 unique deaths. This is a weird one which felt kinda unfinished, like each area is underbaked. Some nice deaths from what I remember. I'm going to guess 40 because I have no idea at all.